Hi everyone!! Hope you all are having a great day. 🙂 For the next few weeks, I will be very busy with promoting my current and new releases, so I decided to compile all of my upcoming events so you all will be able to join in on the fun and interact with me. Author Lynn Lovegreen introduced me on her blog regarding the Writing Process Global Blog Hop; now, I will be doing my post on what inspired me to become an author. I will also be introducing three other authors during the hop: Te’ Russ, Alithea Elizabeth, and Alexandra Warren. I will be taking part in the release party for Brenda Pandos’ new NA release, Truly, Madly, Deeply! Come be a part of the fun as I talk about my latest releases and do a giveaway. The party starts at 11 AM (10 Central) this Saturday! There will be a book discussion for Something Just Ain’t Right in my Facebook group, Sheena Binkley Reading Palace, on February 21st. You must be a member to participate. We will talk about the characters, storyline, and more for book 1 and I might share some spoilers for book 2! 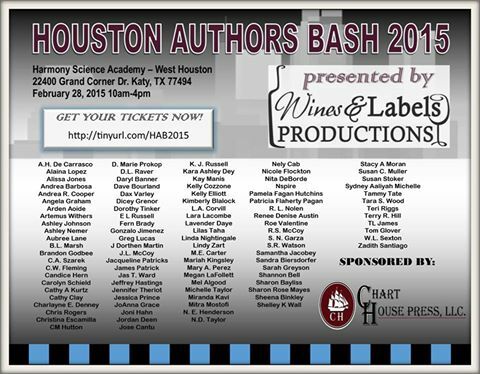 The Houston Authors Bash will be held on February 28th. I will be one of the featured authors during this great event. If you are in the Houston area or plan to be around this time, make sure to come out! Although admission is free, this is a ticketed event. Please make sure to register below and get your free ticket through Eventbrite. This will be the only way you can enter into the event. You can also click on the link for additional information. I, along with other great authors and bloggers, will be taking part in a giveaway hop by Stuck in Books where I will talk about my favorite books. I will be doing an author interview with Sezoni Whitfield and her Facebook group, Writer’s Kaboodle on March 19th at 7 PM (6 PM central). The interview is open to everyone, so feel free to join in and ask questions regarding my current books and upcoming projects. To attend, click on the invite link below. I also will be taking part of an event with author Te’ Russ later in March. I will be posting more details soon.